Waiting for a 2 hour delayed flight in Delhi I worked out how many flights, God willing, I will take before my sabbatical is over. 13. Good job I’m not superstitious. 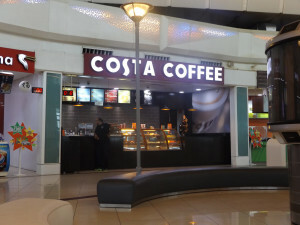 As I sip my flat white from Costas, in several ways the modern airport is an apt image of globalisation. So it is not really english. It is indian english. The current Lufthansa advert on Indian TV shows an Indian grandfather telling his grandson that he is about to take him on a plane, as a treat, to see his father in NY. However, the bad news is that they were going to have to travel with Germans who have no sense of humour and eat bad food. Of course the advert shows the boy being surprised when treated by very friendly cabin crew and eating Indian food on board. The message is clear – we are happy to use your transport and your language, but we will keep our culture. And why not? Great to be following you. Although trying not to stalk you!